I have set my alarm on last night to watch my favorite Christmas movie, It's A Wonderful Life, on at 9.30 am which too early to watch a movie in here, specially in the Christmas day. This movie is always played on Christmas, and as I don't have the DVD so I only have a change to watch this movie every once a year. What a special from this movie? Its a very special movie. If you haven't seen this movie, you can see the detail review in here. I know this movie from my hubby when it was Christmas. He told me that I would like this movie. Perhaps he told me that as I am a sentimental sometimes when watching a drama movie. 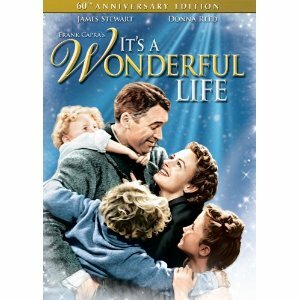 The movie was set in 1947, old enough, but still good enough to watch, and played by an actor James Stewart. This movie very special because its very inspiring me, especially the way I think about a life. Many of us often complain and regret what has passed or happened in our life, and we often forget to appreciate it even just a bit. Just like when George brought by his guardian angel to a life where there was no one knew him, George realised how his life that he always regret was much better than the current life. If you look for something good to watch this Christmas then I highly recommend to watch this movie.